The Semantic Web plays an important role in making the Web more relevant. In this web, data and rules for reasoning about data are systematically described, after which they can be shared and used by distributed agents. The main components implementing this Web vision include techniques such as XML, for adding arbitrary structures to documents; RDF, to express meaning by simple statements about things having properties with values; and ontologies, to formally describe concepts and their relations. A typical ontology, in the sense of being an explicit specification of a conceptualization (Gruber, 1994), consists of a taxonomy with a set of inference rules. The Semantic Web is necessary, but not sufficient to provide better technological support for online communities. Web services cannot be described independently of how they are used, because communities of practice use services in novel, unexpected ways. Although semantics are very important to create more 'intelligent' web services, what has been lacking so far is some formal notion of context of use. As Piers Young summarizes it, "that's where the problem of effectiveness starts getting addressed." Contextual elements like the community of use, its objectives and communicative interactions are thus important starting points for conceptualizing the pragmatic layer. In my invited talk at ICCS 2005, I presented a conceptual model of the Web, which distinguishes between the Syntactic Web, the Semantic Web, and the Pragmatic Web. The Syntactic Web consists of interrelated syntactic information resources, such as documents and web pages linked by HTML references. These resources describe many different domains. The Semantic Web consists of a collection of semantic resources about the Syntactic Web, mainly in the form of ontologies. The ontologies contain semantic networks of concepts, relations, and rules that define the meaning of particular information resources. The Pragmatic Web consists of a set of pragmatic contexts of semantic resources. A pragmatic context consists of a common context and a set of individual contexts. A common context is defined by the common concepts and conceptual definitions of interest to a community, the communicative interactions in which these concepts are defined and used, and a set of common context parameters (relevant properties of concepts, joint goals, communicative situation, and so on). Each community member also has an individual context, consisting of individual concepts, definitions of interest, and individual context parameters. Meaning evolution plays a central role in connecting the various Webs. Two meaning evolution processes pertaining to the Syntactic and Semantic Web are meaning assignment and meaning alignment. Meaning assignment takes place when syntactic resources are semantically enriched, such as by XML-tags being added to HTML-pages. Meaning alignment has to do with interoperability between ontologies: to what extent do their semantic models agree? How can (parts of) ontologies be meaningfully linked? How to deal with definitions that partially overlap in meaning? Much recent work (e.g. Corbett, 2004) addresses these – very hard – issues. Such meaning alignment problems mostly focus on modeling representational and evolutionary aspects of ontologies. However, as we have seen, what needs separate attention are issues of ontology use. 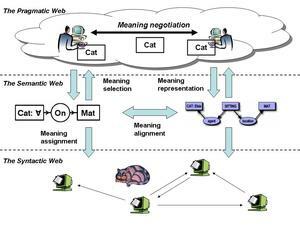 Three meaning evolution processes associated with the Pragmatic Web and its interaction with the Semantic Web are meaning selection, meaning representation, and meaning negotiation. Assessing the consequences of semantic choices in a particular pragmatic context implies that there needs to be some user-controlled meaning selection process of semantic representations. In such a process, the members of the community, who use the knowledge for a particular purpose, are actively involved. Community-accepted changes in the implicit meaning of concepts should in the end also lead to changes in the meaning representation in ontologies. For instance, if users always ask for concepts that are not, or only insufficiently, described in an ontology, it may be worthwhile to add this concept to the ontology. Meaning selection and representation processes, however, do not occur in isolation, but are driven by a meaning negotiation process in a specific community of users. In such a process, stakeholders arrive at the requisite (as determined by their shared goals) amount of agreement on shared concepts. - D. Corbett (2004), Interoperability of Ontologies Using Conceptual Graph Theory. In Proc. of the 12th Intl. Conference on Conceptual Structures (ICCS 2004), Huntsville, AL, USA, July 2004, LNAI 3127. Springer, Berlin, pp. 375-387. Summer so far has not been a holiday for me, it being a very heavy-duty conference season for me this year. However, I have finally made it back home , dealt with the highest of the piles, and now urgently need to do some blog-busting! The third week of July, I was in Kassel, Germany, attending ICCS 2005, the 13th International Conference on Conceptual Structures. Most of downtown Kassel was destroyed during WWII, but it is famous for two unique things: Europe's largest hillside park surrounding the castle of Wilhemshöhe, with its awe-inspiring waterfalls, fountains, and other "water arts", and Documenta, the 5-yearly, largest contemporary arts exhibition in the world! Over the years, my research increasingly got focused on virtual communities. This is nicely reflected in my ICCS publications. In 1997, my key interest was still on the individual user in "networks" ("Applying Conceptual Graph Theory to the User-Driven Specification of Network Information Systems"). However, over time, community aspects got the upper hand. For example, at ICCS 2004, I had a paper on "Improving the Testbed Development Process in Collaboratories", in which I looked at how collaborative communities can improve their socio-technical systems in an evolutionary process of design hypothesis testing over time. This year, based on this progression in my work, I was asked to be an invited speaker, which I consider to be a great honor, especially coming from those long-time colleagues and friends whose work and philosophy I respect highly. I decided to talk about the Pragmatic Web, the next step in the evolution of the Web, in which virtual communities play an essential role. In my next post, I will explain my views on "Patterns for the Pragmatic Web".